There are 47 Assisted Living Facilities in the Carlsbad area, with 19 in Carlsbad and 28 nearby. The average cost of assisted living in Carlsbad is $4,158 per month. This is higher than the national median of $3,346. Cheaper nearby regions include Oceanside with an average starting cost of $3,160. To help you with your search, browse the 244 reviews below for assisted living facilities in Carlsbad. On average, consumers rate assisted living in Carlsbad 4.3 out of 5 stars. Better rated regions include Vista with an average rating of 4.3 out of 5 stars. Caring.com has helped 7 families in Carlsbad find high-quality senior care. To speak with one of our Family Advisors about assisted living options and costs in Carlsbad, call (855) 863-8283. Carlsbad is located on the Pacific coastline in northern San Diego County. It is a resort town, attracting tourists and residents to its beachfront hotels and attractions like Legoland, SeaWorld, and the San Diego Safari Park. Seniors ages 65 and over make up over 16 percent of the residents in Carlsbad, prompting the development of 19 residential care facilities in the city and another 29 located in surrounding communities such as Oceanside, Encinitas and Vistas. These facilities are regulated by the California Department of Social Services. The overall cost of living in Carlsbad is nearly double the national average. While housing is 297 percent higher than average, expenses such as transportation and health care are considerably less shocking at a little more than 10 percent higher than the U.S. average. Carlsbad is safer than 32 percent of U.S. cities and has reasonably low crime rates. Residents have only a 1 in 535 chance of becoming a victim of violent crime and a 1 in 51 chance of becoming a victim of property crime, which is lower than 1 in 225 and 1 in 39, respectively, for the state. The Carlsbad area is home to world-class medical facilities, including Scripps Memorial Hospital, in case of medical emergencies or illness. Social security income is tax-exempt in California. Seniors will be able to use these savings towards the cost of assisted living. Carlsbad has plenty of safe public transportation options available to seniors including public buses, shuttles, a train and rideshare options. The climate in Carlsbad is incredibly mild and comfortable year-round. The average high during the summertime is 75 degrees and the city sees very little precipitation. Assisted Living costs in Carlsbad start around $4,158 per month on average, while the nationwide average cost of assisted living is $4,000 per month, according to the latest figures from Genworth’s Cost of Care Survey. It’s important to note that assisted living rates in Carlsbad and the surrounding suburbs can vary widely based on factors such as location, the level of care needed, apartment size and the types of amenities offered at each community. 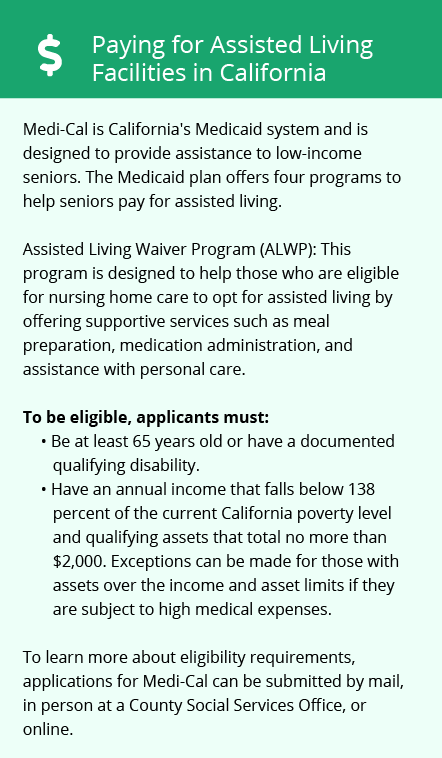 The state of California's Medicaid 1915(c) Assisted Living Waiver will pay for the services provided by residential care facilities for eligible seniors who live in certain counties, including San Diego County. 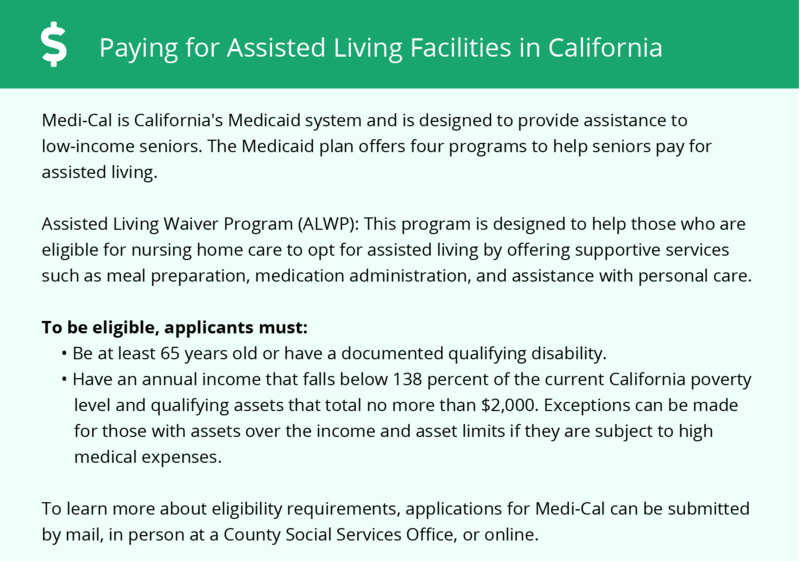 California offers seniors an optional supplement to Supplemental Security Income (SSI) that can be used to help pay for room and board in residential care facilities. Carlsbad and the surrounding area are home to numerous government agencies and non-profit organizations offering help for seniors searching for or currently residing in an assisted living community. These organizations can also provide assistance in a number of other eldercare services such as geriatric care management, elder law advice, estate planning, finding home care and health and wellness programs. To see a list of free assisted living resources in Carlsbad, please visit our Assisted Living in California page. Carlsbad-area assisted living communities must adhere to the comprehensive set of state laws and regulations that all assisted living communities in California are required to follow. Visit our Assisted Living in California page for more information about these laws.